AMC has become a major player in cable television programming, broadcasting a number of series, both original and acquired, in the past decade or so. Now, it’s adding to the list a coproduction that has already aired on BBC1 in the UK and now premieres here in the United States. I’m not too fond of the title of this show since it sounds relatively unsophisticated, but there’s considerably more to the plot here than its title indicates. I didn’t expect to be tuning in to a story about a Russian Jewish family living in London and doing business with an Israeli politician played by David Strathairn. It’s an intriguing concept, I suppose, but one that seems to be so steeped in unnecessary layers and complications alluded to in the opening credits sequence. Most of this pilot episode was dominated by Boris, a character who seemed doomed to die because of how prominent he was. It took me a while to figure out where I knew actor David Dencik from, and a quick look at IMDB suggests that it’s “Tinker, Tailor, Soldier, Spy,” and the twisted Danish comedy “Men and Chicken.” I would never have though to cast American actor Stathairn as the Israeli character, and his accent is questionable if not all that bad. I’m not sure what to make of star James Norton’s charisma, though his transformation to protective child when he talked his mother through triggering the alarm as her assassins banged on the door did show more personality than previously indicated. 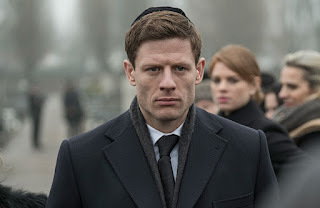 This show does seem to be thorough, like with its depiction of a Jewish funeral, but that doesn’t necessarily mean it’s great or all that worth watching. How will it work as a series? At this point, Norton’s Alex doesn’t have much of a choice other than to allow Strathairn’s Kleiman to invest in his portfolio and take him through whatever moderately illegal measures he’s been advocating, and that’s sure to make things even more complicated and precarious for Alex and his family. I suppose it could be thrilling too. How long will it last? The show appears to have done decently in its initial British run, and reviews over here in the United States are generally positive. It’s being marketed as an eight-part series, which indicates that maybe a second season isn’t in the cards, but knowing how these shows tend to work, I’d imagine that it might be commissioned for a second season if the run is perceived as favorable enough back home.